True originality is a tough thing to come across in Hollywood these days. Maybe it's because, like the old maxim states, there are only seven types of stories to tell. Maybe it's because studio interest is ever-shifting towards already established properties like graphic novels, sequels, and sequels to graphic novels. Maybe it's because those of us who write stories often can't escape the stories that influenced us to write in the first place. In any case, we've seen the end result of derivative storytelling time and time again, and not just in twin films like A Bug's Life and Antz or Tombstone and Wyatt Earp. The Asylum has built its empire by standing on the shoulders of geniouses (and simultaneously stealing their ideas), and even original, groundbreaking films like Inception have been accused of ripping off lesser known fare. But how often can a filmmaker prove outright that he was plagiarised, especially when the courts are brought into it? The answer: At least once, if you're John Carpenter. You might recall that director Luc Besson (he of The Fifth Element and Taken fame, among many others) released a sci-fi action flick called Lockout back in 2012, starring Guy Pearce as an unjustly convicted prisoner who is offered a chance at freedom if he can rescue the president's daughter from a prison in outer space. The film was a financial flop, but perhaps more importantly, bared a striking resemblance to Carpenter's 1981 cult classic Escape From New York, wherein Kurt Russell was tasked with rescuing the President of the United States from a dystopic prison in Manhattan. The court nevertheless noted many similarities between the two science-fiction films: both presented an athletic, rebellious and cynical hero sentenced to a period of isolated incarceration -despite his heroic past- who is given the offer of setting out to free the President of the United States or his daughter held hostage in exchange for his freedom; he manages, undetected, to get inside the place where the hostage is being held after a flight in a glider/space shuttle, and finds there a former associate who dies; he pulls off the mission in extremis, and at the end of the film keeps the secret documents recovered in the course of the mission. 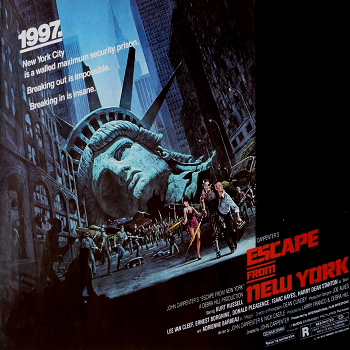 The court held that the combination of these elements, which gave the film [Escape from New York] its particular appearance and originality, had been reproduced in 'Lock-Out', apart from certain scenes and specific details that were only present in the first film. The difference in the location of the action and the more modern character featured in 'Lock-Out' was not enough to differentiate the two films. Besson's production company, Europacorp, was ordered to pay 50,000 Euros to the rights owner, 20,000 to Carpenter and 10,000 to his co-screenwriter, Nick Castle, as a result of the ruling. But personally, I just hope for Besson's sake that no one attempts to call him out for ripping off every female-centric action movie ever with Columbiana. Are there striking similarities between the two? Yes, but thematically they are two different beasts. The setup may be very similar but the idea, the message, of the two films are different. Good for John. Now make another movie maybe? They're remaking "Escape from New York"? Nothing is sacred to these people. It happened to Michael Bay with "The Island". It was pretty much a bold faced rip off of "Parts: The Clonus Horror" and the producers of that film brought a lawsuit against Dreamworks claiming almost 90 points of similarity. They settled out of court for a rumored 7 digit sum. I can see the parallels that are being argued though I'm in agreement that the difference in tone and delivery are worth pointing out too. That said, it may be less about what was already made and more about what they were working on for a reboot/remake. Wondered how it was resolved in passing but never found out. As it is with these out of court settlements everyone clammed up about it when the trial was over and I missed the resolution. Ninety points seems like too much to be overlooked. Lawyers for the plaintiff will make the maximum amount of correlations they can possibly find, in the same way they will claim the maximum amount of damages. Its the job of the court to determine what the actual correlations are. Settlements are largely about risk management, if the lawyers for the defence think they have a 70% chance of wining the will offer a settlement of around 30% what a reasonable damages would be in court. That's quite a turn of events. I liked both films and wouldn't have thought it a copy, despite the obvious similarities. I mean a script is one thing, but an idea? Just a story synopsis? It's a scary precedent since it could start with "ascerbic anti-hero saves president's daughter in exchange for pardon" to "one person saves another person". I do find it dumb for the description to say things like "after a flight in a glider/space shuttle", I mean, "glider/space shuttle", sure, its just his means of transportation but if that diference can be forgiven then what about the rest? Also, that description seems more like what the back of a DVD would say, what about the theme or focus of the movie, or the end message? Do they share the same? I never noticed before, but yeah, they are annoyingly similar. I liked both movies, though: Carpenter's was a classic while Besson's one-liners had me hooked after fifteen minutes. Glad to see this happen: must have pissed Carpenter off something awful working on a remake and having everyone go "yeah, John, I saw this part in that Luc Besson film." Sad really hoped that lockout would try for a sequel but was aware it was a bit of a flop and now with this... meh disapointed but hey in this age of remakes guess its all plagarism. Like the article suggested, Carpenter might not have cared if he weren't already working on an Escape From New York remake. This might have even been a move he had to make to guard against Europacorp attempting the same to he and Fox, if the remake turned out to bare similarities to Lockout. Haven't seen Lockout to judge for myself if it looked like plagiarism, but it's hard to really see this as a victory for good or evil. The lions share of the rewards went to Fox, who own the rights to Escape From New York, so it feels mostly like corporate politics. How will Besson ever recover from that? I mean, he might have to sell a watch or 2. Does that mean Geroge Lucas can sue because Age of Ultron has at least as many bullet points in common with Empire Strikes Back? Can the makers of "Event Horizon" sue the makers of "Ghost Ship"? The similarities are there - salvage crew find derelict ship thought destroyed, led by a person with ulterior motives who tries to kill the crew by the end. The salvage ship is destroyed with the ships mechanic on board. Then there's the whole "sending souls to hell" bit. At the end the ship is destroyed at least partially using explosives and the sole female crewmember has a catatonic breakdown when she's haunted by the ghosts of her crew and being carted away by medics. I think you could add Virus to that list. And maybe Deep Rising. Or then not, seeing how Besson's film was a play-by-play ripoff compared to your example, which relies on stretching the imagination to fit a theme of "hell", whereas the differences in Escape and Lockout are miniscule. Law seems to be so business like in modern times. Less about justice and more about expediency and, as you made mention of, risk management. I suppose it's the cost paid for such an overloaded system. Well, my train of thought is definitely off the rails of this topic. Suffice to say I aught to stop letting Ace Attorney and Judge Dredd sneak across my subconcsious into my perception of the justice system. Even if it would be a lot more satisfying to see it work that way sometimes. Does that mean George Lucas can sue because Age of Ultron has at least as many bullet points in common with Empire Strikes Back? My thoughts exactly. I've heard it said it has all been done before by Shakespeare, the rest are just variations of a theme. I want people's creative works protected but this is ridiculous. I've seen both of these films and did not think of Escape from New York once while viewing it. I thought the main character of that somewhat cliched. And he's no Snake Pliskin. What's next? John Carter of Mars starts suing every super hero and sci fi movie... ever? Might help them recoup some costs. Does that mean the classic "badass action hero in jail" trope is already at its limits? Besson should have been smarter if he took an anti-hero for MC. Gregory House in the House in Jail episode, or the super-psycho guy from "Con Air" would make a more enjoyable type of rescuer, while being more realistic in a carceral environment (survival is less about strength and more about social manipulations). reminded me of my favorite band "nightwish" when tuhomas was accused as well from a finish musician for stealing his song. nightswishs title was EVA and tuhomas said he has never heard of this guy and his music. luckily the case was dropped and that guy who accused tuhomas was pretty much given the finger because there was practically no similarity to his crappy song. lockout was a bad movie. very generic and forgettable. but yes, it did remind me of the far better movie escape from new york. so i give john credit for that. but the newer version on the other hand does not sound so good. Seems slightly unfair, there's similarities in the protagonist but for the most part Lockout seemed like a different beast. The payout seems low, 80k euros is like the cost of a couple stagehands. Jared I have to assume youre not very familiar with Besson, He essentially started the modern Female action hero Genre with La Femme Nikita (1990). There's been Female action hero movies before that but they were mostly exploitation films. Luc was more or less the first guy to promote women as strong protagonists without any kind of super sexualization. Colombiana is what like his 4th outing in that genre? I think thats what kind of burns me. Carpenter and Besson seem like similar minded guys, if anything Besson could be seen as paying homage to Escape from new york. I don't think he was intentionally ripping him off. I would suspect maybe this was more of a rights establishment thing. I feel bad for both these guys because they're "auteurs" who make films because they want to not because for studio pays them. More than anything Luc besson made "Le grand bleu" which make him just about the most original muther**** alive in my book. ...the differences in Escape and Lockout are miniscule. Nonsense. Utter nonsense. The similarities are miniscule, and for that matter, any similarities you CAN mention are common tropes. Sharing a genre is not grounds for claiming plagiarism. Weird. And here I always felt bad for Besson because of the abomination that was the movie Point of No Return, which was based on La Femme Nikita. But it was Escape in LA that created this "trope". Jesus, I don't want to argue with anyone using the word trope unironically, good day. So should we expect a lawsuit between Konami/Kojima and Carpenter soon? I mean as much as I love the MGS series, there's no denying the similarties between the twin Snakes(ho ho ho). MGS1 and EfNY even bare quite a few similar plot elements themselves. To quote "Training Day": It's not what you know. It's what you can prove. I never thought Det. Alonzo Harris was right until I got older and started to see the evidence all around me. Yeah, that's just what we're seeing in this article. For the court to actually agree, there has to have been a lot more similarities than that. I mean, on one hand, I'm kinda curious, because these, "they stole my idea and filed the serial numbers off" cases are pretty common. But, seeing one actually find for the plaintiff is not. Not quite curious enough to actually look up Lockout or read up on the case, but almost. Wait, in "Lockout" they send Guy Pearce in to rescue the President's Daughter, doesn't that mean it has way more in common with "Escape from LA" than "Escape from New York"? Unless I have them backwards, Escape from LA was the one where Snake Plisskin went in to get the president's daughter, and in Escape from New York it was when he went in to get the actual president. Ok, done being a giant geek. I'm sorry, but the plot to both these films is the same as half the movies that came out in the 80's and 90's. Sure, my friends and I all called it "Die Hard in space," but a lawsuit...really? What a waste of time. Incidentally, I actually enjoyed Lockout, and would certainly enjoy seeing another "Escape" movie, if they did it well enough! Also more Luc Besson sci-fi, however derivative, is always welcome! This sets an unfortunate precedent.